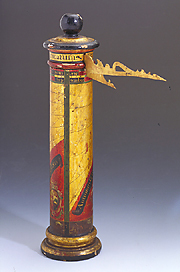 This sundial is in the form of a cylindrical column in gilded and painted wood. On the surface are the hour lines, surmounted by a dedication to the Grand Duke Francesco I de' Medici. The cap of the instrument bears two gnomons which can be contained inside the cylinder. The instrument is unsigned, but can be traced to the Florentine area.